Grow the Game in Your Community – Host a Tennis Festival! 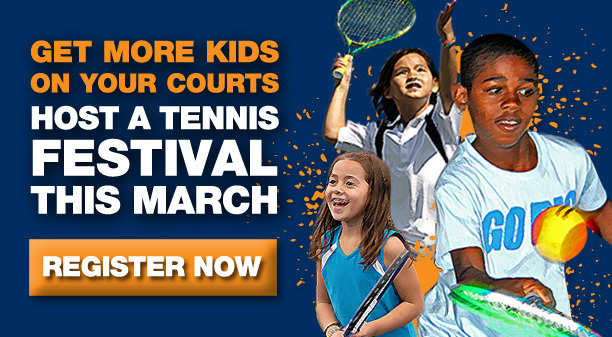 Showcase your youth programs while inviting new players to the game by hosting a Tennis Festival from March 1st to March 31st. Tennis Festivals welcome all ages and abilities and provide an opportunity for kids to experience tennis through a variety of activities. Invite parents to participate and boost registration in your upcoming programs. Publicity! Tennis Festivals will be promoted within the YouthTennis.com searchable database enabling parents to easily find your event. Exposure! Tennis Night in America television broadcast on ESPN2 will drive viewers to YouthTennis.com to search for local events. Membership Offers! Promote the Free 1-Year USTA 10 and Under Junior Membership to increase participation in your programs. Customizable Promotional Materials! Download customizable flyers, posters and press release templates to promote your Tennis Festival and increase attendance. *No purchase necessary, registration on YouthTennis.com starts at 12:01 a.m. on January 15, 2012. United States Tennis Association Incorporated reserves the right to substitute in its soled discretion, limited quantities available. USTA is not responsible for shipments not delivered.